So you finally bought that brand-new phone you’ve been drooling over the last couple of months. Or maybe you’re starting to get bored of your relationship with your device and believe you have to spice things up to avoid breaking up with it. Maybe you’ve heard this “launcher” word from your Android-obsessed friend, but you don’t know what all the fuss is about. Launchers are a beautiful part of Android: you just download a few megabytes and it’s like you have a new phone. As often is the case, there are some established, well-respected names as well as some newer choices trying to disrupt the category with compelling features. It doesn’t matter if you are a newcomer or if you’ve had an Android device since the G1, you’ll want to check these launchers out. I’m sure you’ll find something that caters to your needs. I’m gonna go against popular opinion and will say that Action Launcher is the best third-party launcher. Why? It incorporates several features that make you use your launcher in a totally different way. Shutters, covers, Quickpage, Quicktheme, and I could go on forever. Action Launcher is a prime example of the customization you can get on Android: it has an impressive amount of features that I keep using everyday and can’t live without anymore. The first thing you’ll notice is Action Launcher’s Quicktheme. It analyzes the colors of your background image and adjust several elements accordingly. There’s also a side panel where you will have an alphabetically-sorted list with all of your apps. If you prefer to have an app drawer, there’s one too, and you can configure it to scroll vertically or horizontally. Inside the home screens, the most important features that Action Launcher provides are covers and shutters. It’s a different twist on the traditional folder setup. When you convert a folder into a cover, the first icon inside it will take its place, and touching it will start the app as usual. However, swiping it will open the folder beneath it. Also, swiping individual icons will open a shutter, which shows a widget of your choice. 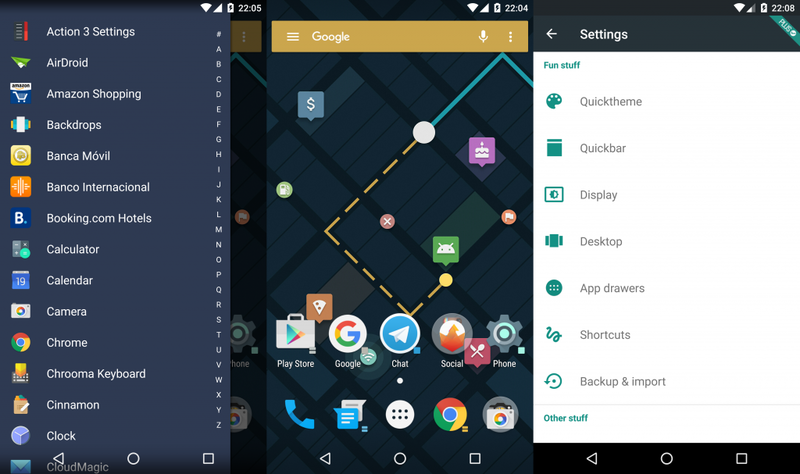 Both of these features help you have an uncluttered but extremely functional home screen. There are several features I can’t talk about for the sake of brevity (Quickpage, Quickbar, icon normalization and gestures come to mind). But you can try Action Launcher for yourself, and believe me, you won’t be disappointed. There’s a $4.55 in-app purchase which unlocks some features, but most of the important features are free. The launcher customizes itself according to your wallpaper. Drawer at both sides: one for apps, and one for whatever you want. The free version can be a bit annoying when asking you to buy the Pro version, but it’s not a deal breaker at all. Download from the Play Store. Nova Launcher provides a clean interface and extraordinary customization options. The fan-favorite is here. A launcher roundup just feels incomplete without Nova Launcher. For several years, it has been the de-facto alternative to those ugly, laggy, and limited offerings that manufacturers keep slapping on devices. Rock-solid performance, more features than you’ll ever use and constant support are only a few reasons to choose it as your default launcher. In previous versions, Nova Launcher populated your home screen with widgets that helped you to import settings from other launchers. However, recent iterations of the app keep it simple, putting in your home screen a couple of folders and a Google Search bar. Also, there’s an option to turn folders into Nova’s own version of Action Launcher’s covers. Meanwhile, the app drawer incorporates vertical scroll, similar to what Google introduced last year on its own launcher. Other interesting features include folders inside the app drawer, unread count badges, icon size normalization, and pull to search. Launch Nova Settings and drool at the number of available options. So. Many. Options. Absolutely everything you can think of customizing can be done here. You can customize the grid size, icon layout, dock personalization, folder customization, gestures, and everything in between. It definitely may be one of the most customizable apps in the Play Store, and that’s why it’s so appreciated and respected in the Android community. Shelling out $4.99 for Nova Prime will give you access to several options (primarily gestures). Also, you can be confident that your money will give you access to future features. I’ve been using Nova Launcher on and off for four years and it has never disappointed me. 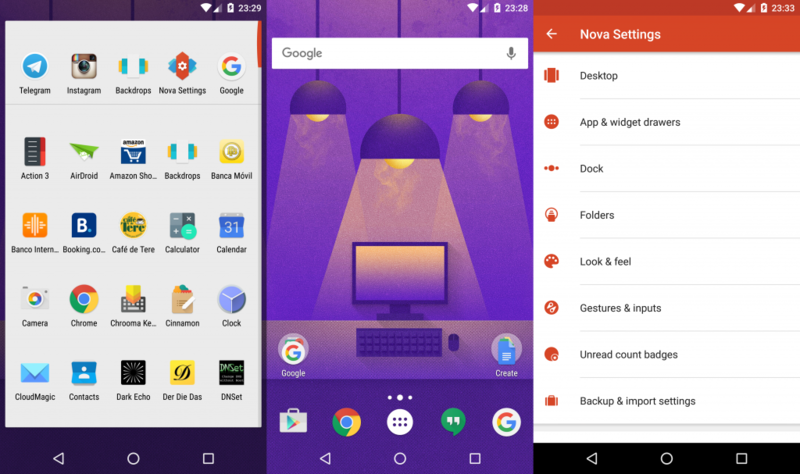 Nova is one of the most emblematic apps in the Android ecosystem, and, if you want a launcher in which you are in control about how everything works, then give it a try. Extremely fluid, smooth, and performant. A massive amount of options at your disposal. First one to implement icon normalization. Seriously? I haven’t found one in four years. Google Now Launcher in action. The most obvious choice for many is Google Now Launcher. It’s the launcher that comes installed by default on Nexus devices and several other phones whose manufacturers prefer to keep their Android experience as stock as possible. Being maintained by Google directly, it’s the launcher in which our Android lords dictate the future of the platform. 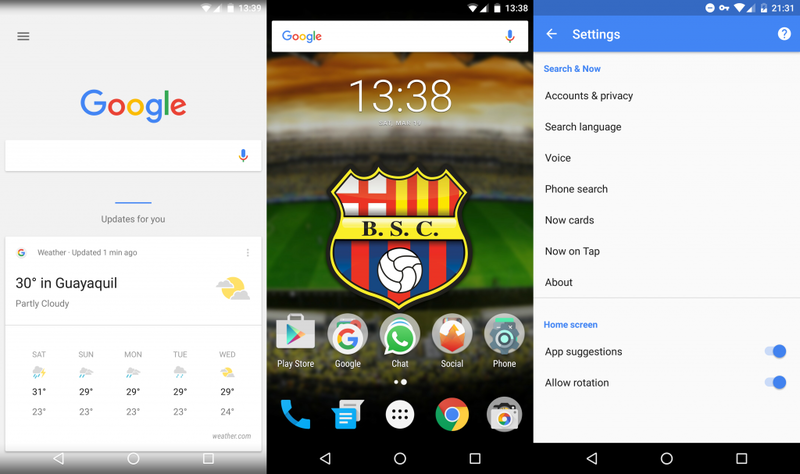 The most distinguishable feature Google Now Launcher offers is its tight integration with Google Search and Google Now. If you have Google Now turned on, the left-most home screen is completely dedicated to Google Now. Having such a quick access to Now cards feels so natural after a while that using it through other methods feels a little bit cumbersome. The rest of the launcher itself is pretty simple. A Google search bar accompanies you on every screen. You can have a (theoretically) unlimited amount of home screens, but the little page indicator at the bottom will stop counting at 20. Back when Lollipop came out, the app drawer featured horizontal navigation in which apps were grouped in cards. However, this changed with the release of Marshmallow. Now, the launcher scrolls vertically, with your most used apps (according to the launcher, since they’re not customizable) at the top. There’s a search bar at the top of the drawer, which can also be accessed by long-pressing the app drawer icon. The biggest downside of Google Now Launcher is that it lacks the level of customization offered by other launchers. No icon packs, no home screen grid changing, and no gestures. You can’t even change the Google Search bar position. If you like what Google offers, then go for it. If you are looking for customization, you’ll have to look elsewhere. Google Now always present in the left-most screen. Maintained by Google, so things will probably never break. Not as customizable as other choices. Settings are located inside the Google App, which can be confusing for some people. 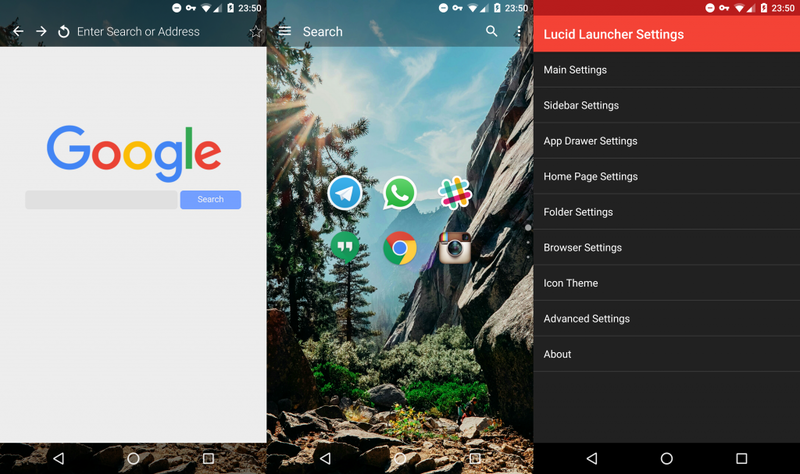 Lucid is an unique launcher that incorporates a browser inside one of its home screens. Definitely one of the lesser known names in the launcher category, Lucid Launcher adds some twists and features to make it different from other alternatives. The most important feature is definitely its peculiar home screen. It has three pages: a list of apps to the left, your home screens at the center, and a web browser to the right. Yes, a web browser, inside your home screen at all times. One of the first things you’ll notice upon installation is that the home screen scrolls both horizontally and vertically. Horizontal navigation will take you between the screens mentioned previously. Place yourself in the center screen, however, and you’ll be able to scroll vertically. Neat, right? Also, you can have different layouts for portrait and landscape orientation. Coming back to the browser, it is obviously not as full-featured as Google Chrome or Firefox, but it’s not barebones either. It loads pages as quickly as Chrome or any built-in browser inside apps. You can control tabs from a sidebar hidden to the right of the browser (similar to how you reveal your favorite apps), add them as bookmarks, find in page, and set as homepage. There are some options you can change, like the default search engine, a toggle to always request desktop sites, and remove all browser traces. Overall it’s a nice thing to have, and one that could potentially make you ditch your current browser setup. Unlike all other launchers in the list, Lucid is free but ad supported. There’s a $2.00 Pro version, which is not an in-app purchase, but a completely different app listing. This will unlock more gestures, animations, some customization options, and will completely remove ads. I believe the price is worth it. Lucid is definitely a feature-packed launcher that brings some innovative features to the table, and one that should get more attention. Innovative navigation on home screens. Built-in browser on right-most screen. Layout for portrait and landscape orientations. Arranging widgets on the home screen can be a bit cumbersome. Microsoft can make great Android apps too! It’s no secret that Microsoft is really committed to making Android apps. It has worked for a couple of years in bringing quality apps and services to the platform. Some people say that it even brings more quality to its Android products than to its Windows Phone counterparts. 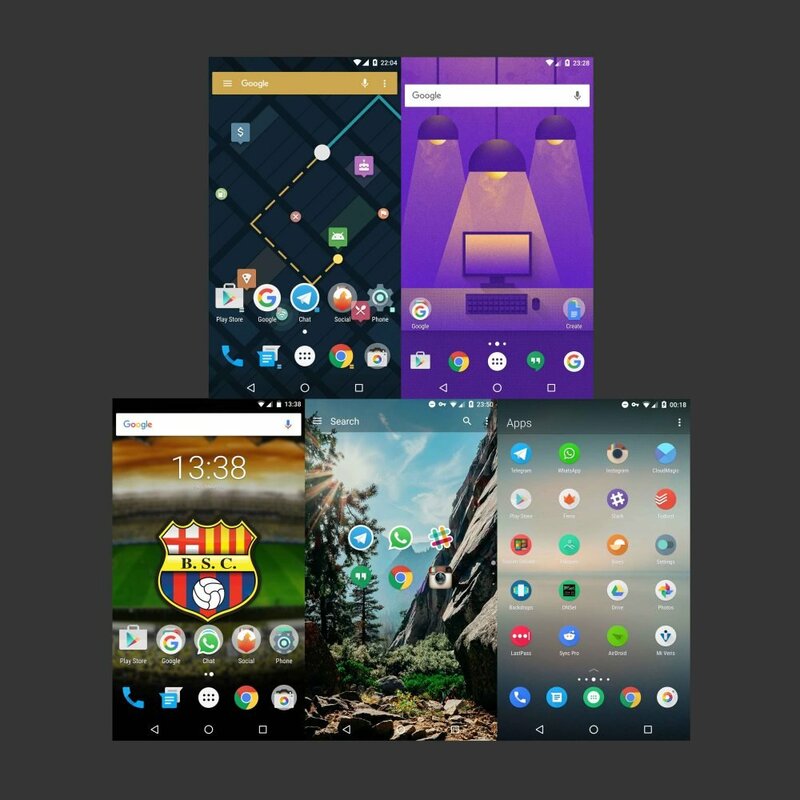 Anyways, Arrow Launcher is the result of several months of development, and it brings different, useful features in a really attractive package. When you set it up, Arrow analyzes your apps and determines the ones you use the most. It makes you choose a minimum of five of these apps so they can be first and foremost on your home screen. However, when swiping to your other screens, you’ll see that this is not a conventional launcher. The left-most screen is dedicated to widgets. There’s also a page which shows recent activity, such as recently used apps, new photos taken, newly installed apps, and calls activity. To the right, you’ll see a page called People, which shows recent calls you made and received, SMS activity, and has a shortcut to the dialer. Finally, the right-most screen is the home to Notes and Reminders. Another perk of Arrow Launcher is one called Wallpaper of the Day. You remember that Bing Search changes its background everyday, right? Arrow can automatically change your background image to match Bing’s wallpaper. The dock incorporates an innovative solution by adding a slide-up panel to it, in which you will find quick settings toggles, brightness slider, and most used apps, slightly similar to Control Center on iOS devices. A quick visit to the app drawer reveals a list of apps categorized alphabetically, while showing your most used and recently install apps at the top. There’s also a tab for widgets, similar to what launchers did in the pre-Lollipop era. It looks really good and the scroll bar with the animated letters while navigating the drawer is neat. Unlike other third-party launchers in this list, Arrow is provided free of charge, with no in-app purchases. Granted, what Microsoft would gain from charging for its launcher would probably do nothing to their bottom line, so they are focusing on attracting new users instead. For now, however, the launcher is a little short on customization options, but custom icon packs and hiding apps are supported. If you want a good-looking, functional launcher for your device, Microsoft has in its hands a really good product that works perfectly out of the box, and, with the software giant’s support behind it, Arrow Launcher can only get better. Self-populated screens with useful information and features. Gorgeous home screens with blur effects, well-placed elements, and the choice of downloading wallpapers automatically from Bing. Dock doubles as a Control Center-like toolbar. As we can see, each launcher offers different approaches, functionality and looks. If you are looking to control absolutely every aspect of your launcher, from grid size to gestures, then you can’t go wrong with Action or Nova. If you prefer a more streamlined, clean look that closely follows Google’s Material Design, are a heavy Google Now user, and can cope with the lack of customization, then Google Now Launcher is definitely a no-brainer. If you’ve already tried the previously mentioned launchers, and want to check out a couple of launchers that move away from the traditional way of doing stuff, Lucid and Arrow are for you. Some launchers were unfortunately left out, but that doesn’t mean they’re bad. Apex Launcher is a household name in the Android community. Buzz Launcher and Lightning Launcher focus heavily on customization. Aviate offers a similar approach to Arrow, but it suffers from a rather pesky Yahoo services integration. 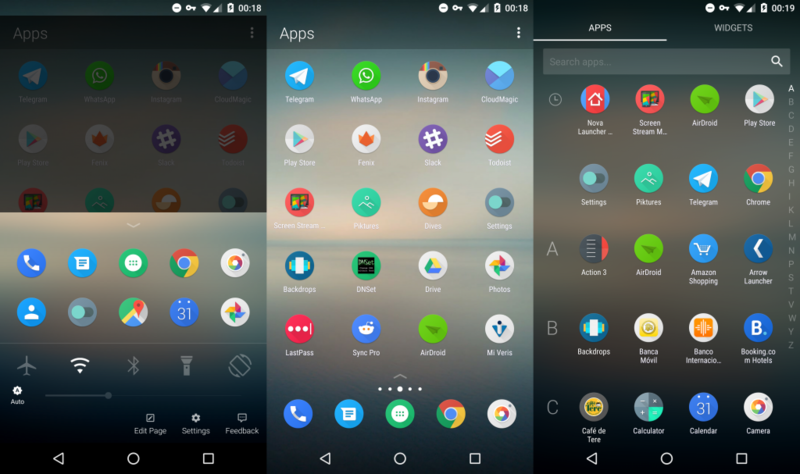 Smart Launcher categorizes your apps to make your phone easier to use. Thanks to the openness of Android, there’s something for every taste, and you really can’t go wrong with any choice. Spend a couple of days with each launcher, choose one, and enjoy!